Simferopol, Ukraine… 1941 – On November 1, 1941, the Germans occupied Simferopol, a Ukrainian city on the Crimean peninsula near the Black Sea. By the time they reached Simferopol, most of the 20,000 Jews living there had fled. Jewish refugees from other regions of Ukraine, however, had come to the city as German forces moved farther into Soviet territory. When the Germans arrived in Simferopol, they ordered the more than 14,000 Jews in the city to register with Nazi authorities and to wear arm bands displaying the star of David. In November and December of 1941, thousands of Jews were rounded up, loaded onto trucks, taken to the outskirts of the city, and shot. Among those killed were the grandparents of Rita and Anatoly Golberg. The children’s mother, Eugenia, knew that Rita and Anatoly would likely be killed as well and sought to find a place to hide them. She had to look no further than the house next door, where the Tashtshiyan family lived. Eugenia pleaded with her neighbors to shelter Rita and Anatoly. Survivors of the Armenian genocide during World War I, the Tashtshiyans sympathized with the Golbergs and understood the dire circumstances they faced. They immediately offered to take in the two Jewish children, even though it meant endangering the lives of their own children, Hasmik and Tigran. Their assistance could not have come at a more crucial time. From December 11 to 13, Einsatzgruppe D rounded up and murdered the remaining 12,500 Jews of Simferopol. They did not find Rita and Anatoly Golberg. 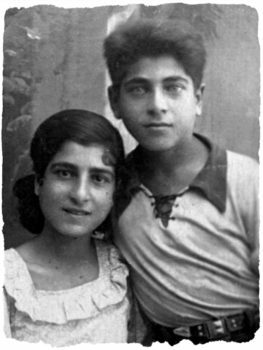 Hasmik and Tigran had built several hiding places for them – one in the attic, one in the basement, and one in the shed outside their house – and the two Jewish children went undetected. Hasmik and Tigran shared their food and clothing with Rita and Anatoly and cared for them until April 1944, when Simferopol was liberated by the Soviet army. Eugenia Golberg survived the war and reunited with her children after liberation. Anatoly passed away in 1975 and kept in touch with the Tashtshiyans until then. Tigran passed away in December 2007. Hasmik died in 2008.